Development Horizons by Lawrence Haddad: Scaling up nutrition -- how to get effective engagement of multiple stakeholders? 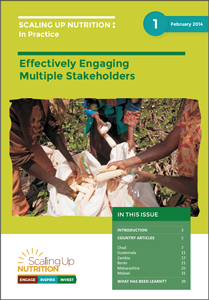 Scaling up nutrition -- how to get effective engagement of multiple stakeholders? In a world where it seems harder than ever to find the time for quiet reflection a new "In Practice" series from the Scaling Up Nutrition (SUN) movement is most welcome. The first out in the series is entitled "Effectively Engaging Multiple Stakeholders". In it, six of the 50 SUN members reflect on what it takes to develop effective multi-stakeholder platforms and why it is important to do so. The members are: Benin, Chad, Guatemala, Maharashtra, Malawi and Zambia. While the diversity of multi sector platform (MSP) experience is interesting, the sections I was most interested in were the lessons learned and the challenges of trying to work in this way. Successful MSPs bring people together, resolve conflicts and get tangible things done--things that are likely to accelerate undernutrition reduction and which can be tracked. There is no magic formula, just lots of hard work. These MSPs remain reliant on the personal commitment of key individuals. Some might say this personal commitment is too fragile a basis for a sustainable MSP, but I'm not worried. This is how positive change happens. The main question for me is how can we create an environment where the current champions can nurture the development of future ones. Triangulation. One of the reasons the MSPs are valuable is that they help us focus on one issue from multiple perspectives. We can finally get a truly rounded perspective on nutrition. But what if the different angles of observation generate very different implications? This is not a problem but a strength--we want to proceed on a secure basis, one that everyone owns. But what happens if we get stuck? Do the most powerful stakeholders (unlikely to be communities themselves) begin to throw their weight around? And then what happens? I would have liked to hear more about what did not work and what was deeply frustrating and how these challenges are being addressed, but in a practice paper it is very difficult to expose the mistakes we all make, never mind the vulnerabilities we all have. So I really applaud the 6 countries for giving us a glimpse into their processes and to the SUN Secretariat for facilitating the lesson learning--within and outside of SUN. And as the MSPs develop I hope they will feel more able to move a little more from valuable reflection to even more valuable critical self reflection. Nutrition and the SDGs: OWG or OMG?